In late summer of 1984, I anxiously awaited my first trip to the seafloor in the submersible Alvin. There was a delay in launching the sub, but I resisted the urge to have a drink, anticipating one final trip to the bathroom before crawling into Alvin’s three-person, 6-foot sphere for eight hours. I was excited not only about my first chance to dive, but about visiting the home of the seafloor rocks I had long been studying for my master’s thesis. Since 1982, I had spent most of my waking hours examining pieces of seafloor vent deposits that had been recovered during a routine dredging operation along the Juan de Fuca Ridge off the Pacific Northwest coast. Expecting to find common seafloor rocks called basalts, scientists were surprised to pull up fragments and boulders of massive sulfide covered with small tubeworms. They had discovered the fourth and, at the time, newest site of hydrothermal venting on the seafloor, a place now known as the Main Endeavour Field. These rocks helped launch my scientific career. In the years leading up to my 1984 dive, I had learned that hydrothermal vent systems played a significant role in transferring heat and mass from the solid Earth to the ocean, and that the vent sites host unusual biological communities, including tubeworms, bivalves, crabs, and fish that thrive in the absence of sunlight. It was also becoming clear that the relatively constant chemistry of the ocean was in part sustained by hydrothermal activity. What my colleagues and I were only beginning to realize then was that hydrothermal vent systems are like snowflakes—no two are ever exactly alike. 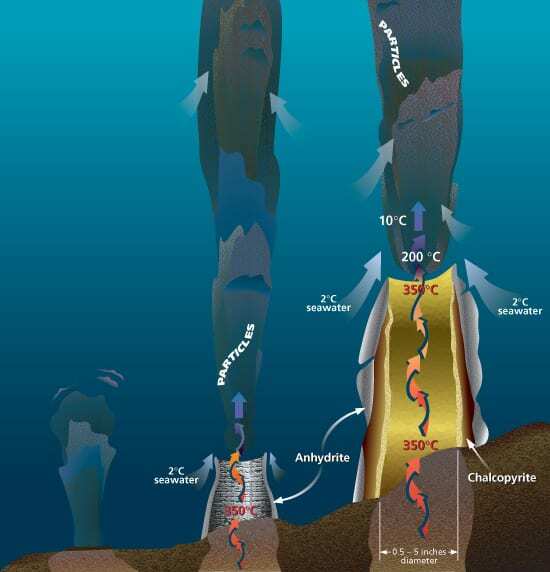 When scientists in Alvin discovered the first active hydrothermal system in 1977 at the Galápagos Rift, they found warm fluids, later determined to be a blend of cold seawater and hot vent fluids, seeping from seafloor crust. Never-before-seen organisms were present at the vents, including large clams and tall, red-tipped tubeworms. The discovery of these vent systems immediately answered a question long posed by geophysicists: How is heat transferred from Earth’s interior to the oceans? Earlier studies had shown that, contrary to model predictions, not as much heat was being transferred by conduction (particle-to-particle transfer) near the ridge crests. Scientists hypothesized that heat was also transferred by convection, as fluid circulated within the crust near mid-ocean ridges. Sure enough, cold seawater is entering cracks and conduits within seafloor crust. It is being heated by underlying rocks and rising and venting at the seafloor, carrying significant amounts of heat from Earth to ocean. The discovery of vents allowed scientists to begin to answer another major question: How does the ocean maintain its relatively constant chemical composition? Over time, rivers drain materials into the oceans, and winds blow in particles, some of which dissolve to add chemical elements to the oceans. Some of these elements, in turn, exit ocean waters, settling in ocean sediments, for example. Many components of seawater—including lithium, potassium, rubidium, cesium, manganese, iron, zinc, and copper—enter the oceans via vents. They are leached from seafloor crust by subterranean chemical reactions with hot hydrothermal fluids. 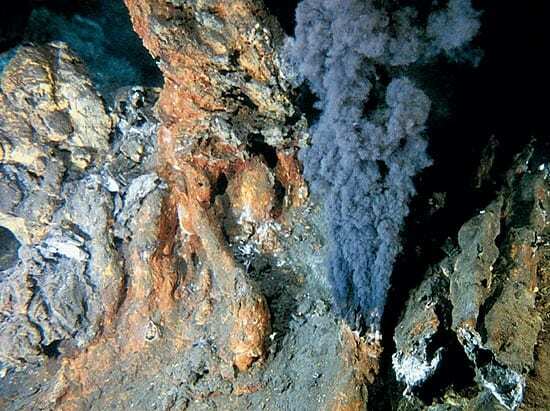 Other hydrothermal vent reactions draw elements out of seawater and place them back into the earth. For example, magnesium eroded from land is carried to the ocean by rivers. Yet magnesium concentrations have not increased in the oceans. Scientists puzzled for decades over where all the magnesium could be going. Scrutinizing hydrothermal vents, researchers found that seawater entering seafloor crust is rich in magnesium, but fluids exiting the vent are free of it. Oceanographers surmised that magnesium is left behind in the crust, deposited in clay minerals as seawater reacts chemically with hot rock. In those early years when observations were few and samples fewer, my thesis rocks provoked considerable interest. In some ways, the rocks were similar to those recovered from the East Pacific Rise, but in other ways they were quite different. The Main Endeavour Field samples were rich with amorphous silica, which should only precipitate if the hydrothermal fluid had cooled without mixing with seawater. And they did not contain anhydrite, a common vent chimney mineral that dissolves in seawater at temperatures less than about 150°C (302°F). We theorized that the dredged pieces must have come from the low-lying mounds that lay beneath and around black smoker chimneys. Our dives to the Endeavour Field in 1984 would tell us if we were correct. The trip to the seafloor took 90 minutes. As we approached the seafloor, the pilot asked me to look out my viewport and let him know when I saw bottom. Alvin’s lights were turned on. It was like the curtain going up in a dark theater and the stage lights going on. We were hovering over the same basaltic rocks that I had spent countless hours studying in photographs. Then to my right, I could see a rock wall rising from the seafloor. It was obvious from the hedges of pencil-diameter tubeworms sticking out of the tops and sides of the cliffs that I was looking at large hydrothermal vent structures.The view was nothing like what had been described at the East Pacific Rise. Instead of low-lying mounds of sulfide debris topped by active smokers, we saw steep-sided structures standing 15 meters (50 feet) high. Why was this site so very different? How could these chimneys stand there like multi-story buildings without collapsing? Answers to these questions came from studying new samples. We learned that the tall chimneys structures were essentially “cemented”—silica filled pores in the vent structure walls as the emerging fluids cooled, making the structures sturdy. But why was so much silica precipitating at this site? The fluid chemistry provided answers: This vent site’s fluids were rich in ammonia (NH3). As the ammonia-rich fluids cool, NH3 takes up excess H+ ions to form NH4, which raises the pH of the fluids. The higher pH likely allows silica to precipitate within Main Endeavour Field structures; at sites with no NH3, low pH probably inhibits the formation of amorphous silica. As with almost every visit to a new vent site, our survey of the Main Endeavour Field raised as many questions as it answered. The differences among known hydrothermal systems and the revelations that accompanied each new discovery provoked oceanographers to hunt for new sites. We were explorers trying to learn as much as we could. Hypotheses were advanced, only to be proven wrong by yet another discovery. More visits to these seafloor hot springs made it clear that all vent fluids are not the same. Rather, the chemical composition changes from ridge to ridge—and from time to time. Researchers returning to some vents found that the chemistry of vent fluids was not constant, changing on scales ranging from days to years. These vent sites were all associated with sites of recent magmatic activity, with recorded earthquakes and evidence that dikes had been intruded into the ocean crust and, at some sites, that lava had been extruded onto the seafloor. The vent fluid compositions were changing as these dikes cooled, and as fluids penetrated deeper into the crust. 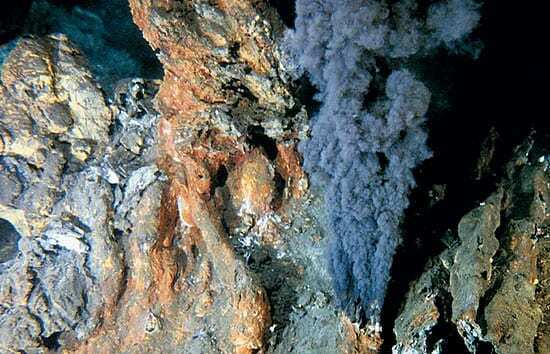 In the early 1980s, after a number of vent sites had been found in the Pacific, scientists began to wonder if hydrothermal activity and active black smokers might exist on the more slowly spreading Mid-Atlantic Ridge. The hydrothermal vent systems transfer large amounts of heat from magma or newly solidified hot rock, but on slow-spreading ridges the spreading rate, and magma delivery rate, is much less (about 1/3) of that on the northern East Pacific Rise and Juan de Fuca Ridge. To our surprise, exploration from the mid-1980s through the early 1990s gradually made it clear that hydrothermal systems may be spaced further apart on the Mid-Atlantic Ridge, but they tend to generate much larger mineral deposits. Expeditions to the Southwest Indian Ridge in 2000 and the Gakkel Ridge (under the Arctic Ocean) in 2001 revealed that hydrothermal venting occurs on even the slowest-spreading portions of the mid-ocean ridge system. Two decades of study have taught us that there is no single type of seafloor hydrothermal vent system. The plumbing systems beneath the seafloor are both diverse and incredibly complex. Ocean scientists today are posing questions about the dimensions and evolution of the hydrologic systems beneath vent sites. We puzzle over how hot these fluids get, how deep into the crust they descend, and how far they travel before venting at the seafloor. And where does seawater enter these systems? To answer these questions, we will need to continue exploring, not only over geographic space, but also over time. In the early years, most vents were discovered serendipitously, but as we’ve explored and learned more about these systems, we’ve been able to develop systematic methods for pinpointing sites. For example, a technique of “tow-yowing” has been developed, where a conductivity-temperature-depth (CTD) sensor is raised and lowered through the water column in a saw-tooth pattern above the ridge to map the locations of plumes, and then to home in and map the buoyant portion of plumes coming directly from active vent sites. This technique was used successfully to find vent sites in the Pacific and Atlantic, and most recently in the Indian Ocean. The need to explore the dynamics of hydrothermal systems over time has led to new technologies and the development of seafloor observatories. New, more precise and durable instruments allow us to monitor temperature and fluid chemistry at vent sites for hours, days, or months—as opposed to observing those properties for brief moments and grabbing one-time samples. The future of hydrothermal studies was displayed in a recent series of coordinated experiments. With support from the National Science Foundation’s Ridge Interdisciplinary Global Experiments (RIDGE) program, a team of researchers built a seafloor observatory on the Endeavour segment of the Juan de Fuca Ridge. During the summers of 2000 and 2001, scientists made complementary and continuous observations centered around the Main Endeavour Field (the same site I first visited in 1984) and at vent sites to the north and south. The program goals included making more accurate measurements of the heat and mass flowing from the system, and observing how the hydrothermal plumbing is influenced by tides and by high-temperature reactions that separate elements into saltier liquids and more vapor-rich fluids (a process called “phase separation”). Instruments were deployed to continuously monitor vent fluid temperatures, flow rates, and chemical properties. Scientists also used newly developed samplers to collect fluids at regular time intervals. While these instruments were in place, other researchers made acoustic images of vent structures and venting fluids. Still others used the Autonomous Benthic Explorer (ABE) to measure water column properties above the vent field, seafloor depth, and magnetic signatures. Later in the program, the team deployed a systematic array of current meters, thermistor strings, magnetometers, and tilt meters. Scientists even tested techniques to “eavesdrop” on the data being collected and download it without removing the instrument from the vent. The result of this collective effort was the most comprehensive study of a hydrothermal system to date, and a model for future seafloor observatories. As we develop these new techniques and instruments, our ability to explore ongoing seafloor processes will grow. More than a quarter-century into our studies, we still find ourselves constantly revising and refining our ideas about hydrothermal systems. At the same time, as we home in on the fine details of how these systems work, we continue to find new sites that completely break the mold. As recently as December 2000, researchers diving in the Mid-Atlantic discovered “Lost City,” a vent site located far away from the ridge axis, on old rather than nascent seafloor crust, and with 15-story-high white minaret-like structures made of carbonate—a mineral that is not found at most other known vent sites. So after 32 dives to the seafloor to study vents, I am often still surprised, and I am always awed. Even when I return to a vent site that I’ve visited before, I still find it an unbelievably beautiful sight to watch jets of hot fluid mixing with seawater, and unusual organisms that make their homes near these vents. Like my colleagues, I look for ways to make our studies more precise, more methodical, and more continuous. But 20 years after my first dive, I still enjoy seeing it all live. It’s the difference between watching a movie of a waterfall and standing next to one. The Birth of a Black Smoker: The key to the creation of black smoker chimneysis an unusual chemical property of the mineral anhydrite, or calcium sulfate (CaSO4). Unlike most minerals, anhydrite dissolves at low temperatures and precipitates at high temperatures greater than ~150°C (302°F). 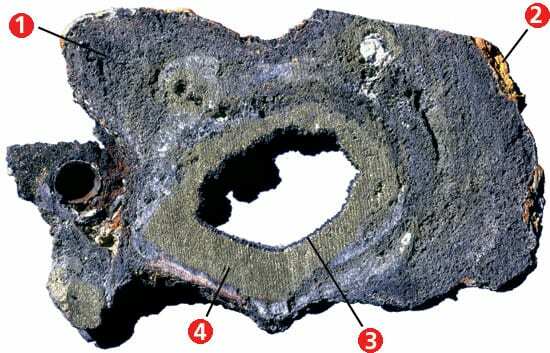 Cross Section of a Black Smoker Chimney: As hydrothermal fluid vents from the seafloor, different minerals in it precipitate at different temperatures, creating a multi-layered black smoker chimney.